Tom is in the last stage of his quest – but it will also be the most difficult and dangerous. The peace of Avantia has been shattered by a new Beast: Trillion, the fearsome three-headed lion! If he is to save Avantia, Tom must wrestle the final piece of magical golden armour from Trillion. But this beast isn’t going down without a fight. Can Tom possibly succeed? OUTSTANDING! Although the three headed lion was unstoppable and Wizard Aduro was found, this is EPIC! IT was super cool!!!!!! i thout Tom would die but adventoully he did’nt and Turgus was fighting as well!!......... 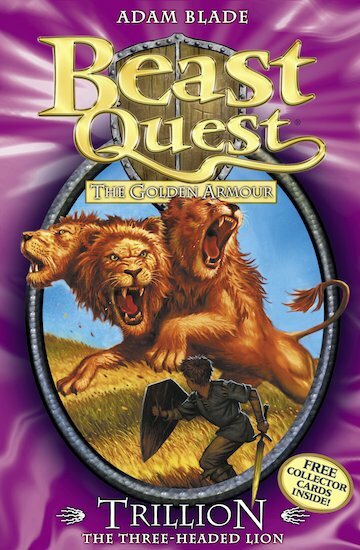 and to let you know i read MORE than 7 Beast Qeust books including this one. I think this was the best book so far and most addictive. I loved the way at the end the lion (Trillion)turned into a portal and they have no clue where it leads. Excellent ending to the second series.